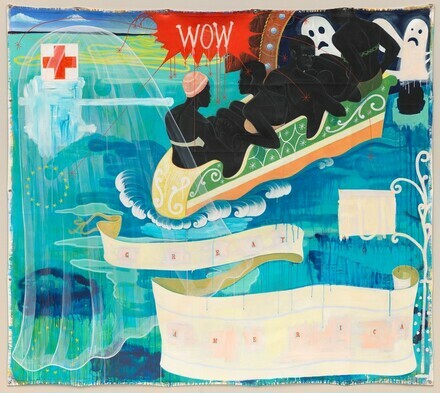 Great America (1994) by Kerry James Marshall is the Gallery's first painting by this major midcareer artist. A devoted student of the human figure and the history of art, Marshall draws upon the experience of African Americans to create imposing, contemporary history paintings. Great America is contemporaneous with Marshall's well-known Garden Project (1994–1995), a series of paintings based on housing projects with "gardens" in their names, such as Nickerson Gardens in Watts, where he grew up. In those works, Marshall sought to convey the dignity and complexity of lives set within difficult circumstances. In Great America he re-imagines a boat ride into the haunted tunnel of an amusement park as the Middle Passage of slaves from Africa to the New World. What might in other hands be a work of heavy irony becomes instead a delicate interweaving of the histories of painting and race. The painting, which is stretched directly onto the wall, creates a screen or backdrop onto which viewers project their own associations triggered by the diaphanous yet powerful imagery. Consigned by the artist to (Koplin del Rio Gallery, Culver City, California); sold April 1995 through (Greg Kucera Gallery, Seattle) to private collection; (Christie's, New York); private collection; purchased 9 May 2011 through (Jack Shainman Gallery, New York) by NGA. In the Tower: Kerry James Marshall, National Gallery of Art, Washington, D.C., 2013, unnumbered brochure, repro. Meyer, James. "In the Tower: Kerry James Marshall." National Gallery of Art Bulletin 48 (Spring 2013): 32-33, repro.